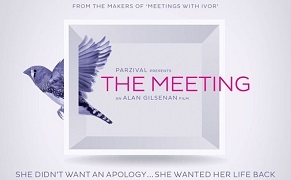 'The Meeting' is based on a real meeting which took place between Ailbhe Griffith and the man who, nine years earlier, subjected her to a horrific sexual assault and left her seriously injured and fearing for her life. Griffith, in an extraordinary move, has chosen to play herself in this unique drama from filmmaker Alan Gilsenan. In a modest room in a Dublin suburb, two people prepare for a meeting that could have an enormous impact on their lives. For both of them, it is a complete step into the unknown. What emerges is a truly unique and unorthodox cinematic experience as Ailbhe courageously seeks healing through a progressive form of justice, rapidly gaining momentum throughout the world.